The shank is one of the worst (and most embarrassing) mishits in golf. A shank happens when the golfer hits the golf ball on the innermost portion of the clubface, so far toward the heel that the golf ball is contacted by the rounded hosel. 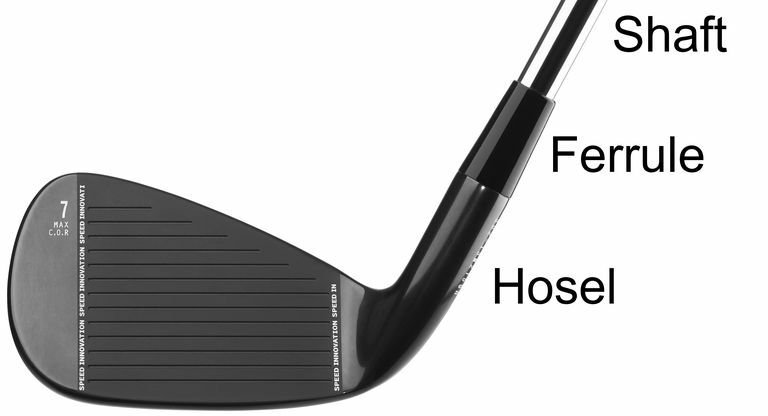 Or, even worse, the golf ball misses the clubface entirely and solidly connects with the rounded hosel. And since the hosel is rounded, the ball can shoot off in just about any direction with various spins. But most commonly, a shank results in a ball that shoots out to the right (for a right-hander) at a severe angle. The shank is such a dreaded shot that many golfers are superstitious about even hearing the word while on the golf course. In her book, Mr. Hogan: The Man I Knew, former LPGA pro Kris Tschetter described the incredulous reaction Ben Hogan had when he saw her hit a shank: "Oh, good God!" A golfer who shanks a lot might be said to "have the shanks" or "have a case of the shanks" or to be "shanking it" or to have "shanked it." A golfer who shanks a shot is likely to be very embarrassed. And might even be laughed at by his or her playing partners, if the shanker is part of a group of golf buddies who enjoy teasing one another. One of the worst things about hitting a shank is that "the shanks" often arrive without warning. You might be hitting it great and, all of sudden, seemingly out of nowhere, your golf ball shoots off the hosel 75-degrees to the right. There's a scene in the movie Tin Cup in which Roy (the Kevin Costner character) begins hitting a bucket of balls on the driving range. His caddie, Romeo (played by Cheech Marin), watches as Roy shanks the first one ... then the second one ... then another one. A panicked Roy screams out for help. "Looks like you have El Hosel, the laterals—you know, the S-word," Romeo says. Everyone who plays golf has or will hit a shank. This is true of recreational golfers, but even of professional golfers. (Although obviously a high-handicapper is far more likely to hit a shank than is a tour golfer). Even the greatest golfers on the planet hit shanks—rarely, but it does happen. Roger Weathered, a top amateur golfer in Britain in the early part of the 20th century who once lost in a playoff at the Open Championship, wrote in a 1931 book that "of all the golfing diseases, shanking is by far the most outrageous in its devastating results." The pros can be particularly superstitious about talking about or witnessing shanks because of the belief that shanks can be contagious. One great golfer hitting a shank might cause the other tour golfers in the group to "catch a case of the shanks." "Shanks are so contagious that even watching them is risky, and that includes the pro players." The shank is something that gets into a golfer's head. So what can go so wrong with your setup or swing that you contact the ball on the hosel rather than on the clubface? Or leaning your head toward the ball or the target. Fixing relatively minor setup issues is often enough to cure a case of the shanks. "Shankers almost always set up too close to the ball, with their weight back on their heels. As they shift forward during the swing, their weight comes off their heels, moving the club even closer to the ball, so that the hosel hits the ball." You can search YouTube to find many videos by golf instructors discussing faults and fixes for the shank. Because golfers don't like to say or hear the word "shank" when on the golf course, we've come up with some creative slang terms to use instead. The most common alternative name for a shank is "hosel rocket," because the golf ball rockets off the hosel of the club. From the Tin Cup scene described above, we already know two other terms: El Hosel (pronounced "el ha-ZELL") and "the laterals." Among the other slang terms for a shank are scud, pitchout and snake killer.